Hey babes! I know Valentine's Day is over but doesn't it always seem like the ideas only start flowing after the fact? 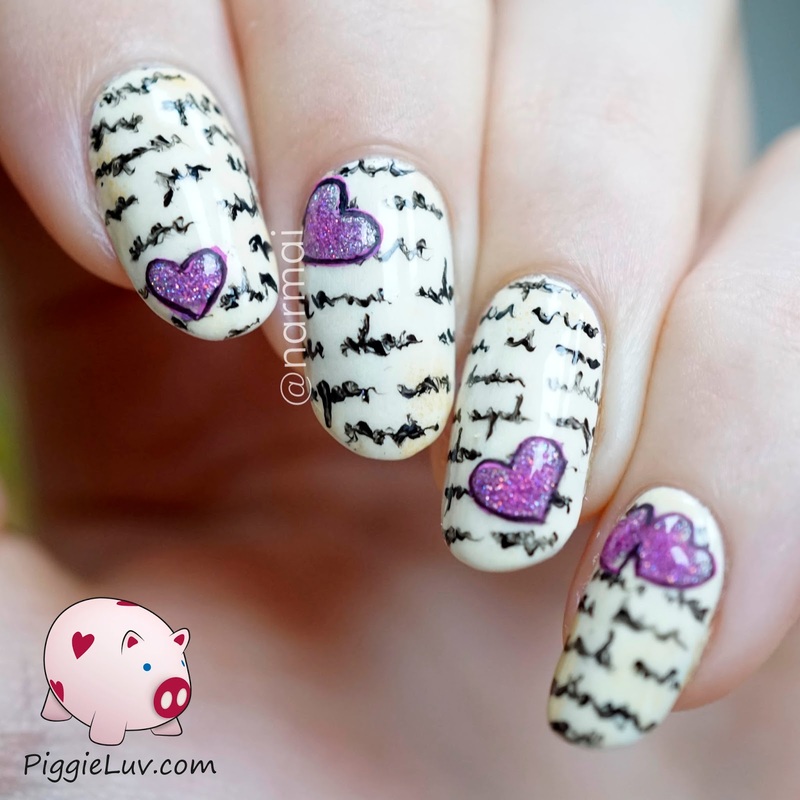 I've been wanting to make a love letter so I made the parchment base, freehanded some text and then... didn't know where to go from there :-p The hearts were just something spontaneous, I like that they're kind of 3D! Click to see more! I'm in a Facebook group called Hobby Polish Bloggers and we're all, like the name says, polish bloggers! It's a great group of ladies and we all share our tips about blogging, and we help eachother out. We came up with the idea to do monthly link-ups with a specific theme. We've done Halloween, fall favorites, Christmas and 'New To You'! This time, the theme is Valentine's Day. I had my V-day series scheduled already and it felt weird to post one part of my series as part of a linkup, so I'm posting now... after V-day. Hey, just roll with it! The base is OPI Alpine Snow and I sponged acrylic paint on it to make it look like parchment, or just old paper. The text is actually really easy to paint, as long as you make a few letters with ascenders and descenders (t, f, g, j, anything that goes outside of the x-height) it will look like real text. If you have NO idea what I'm going on about, that's my Graphic Design degree talking. 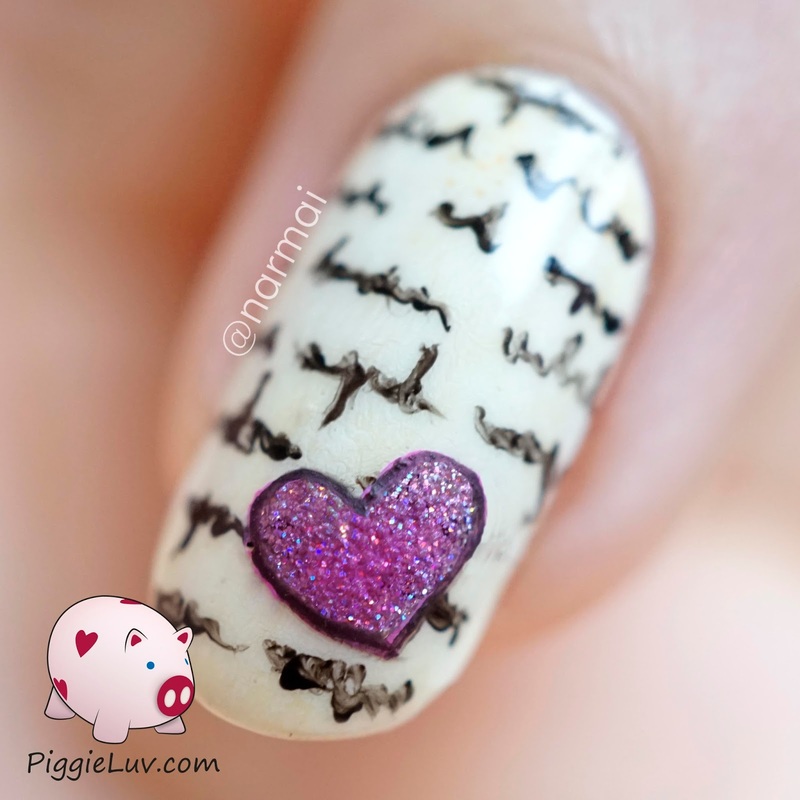 I made the heart shape by 'taping' off the nail with Liquid Palisade and sponging it with China Glaze Glistening Snow. The pretty pink hue is added by OPI Be Magentile With Me. Check it out for yourself in the video! !